Launchpad couldn't import bug #20226 from freedesktop.org Bugzilla. substitute. 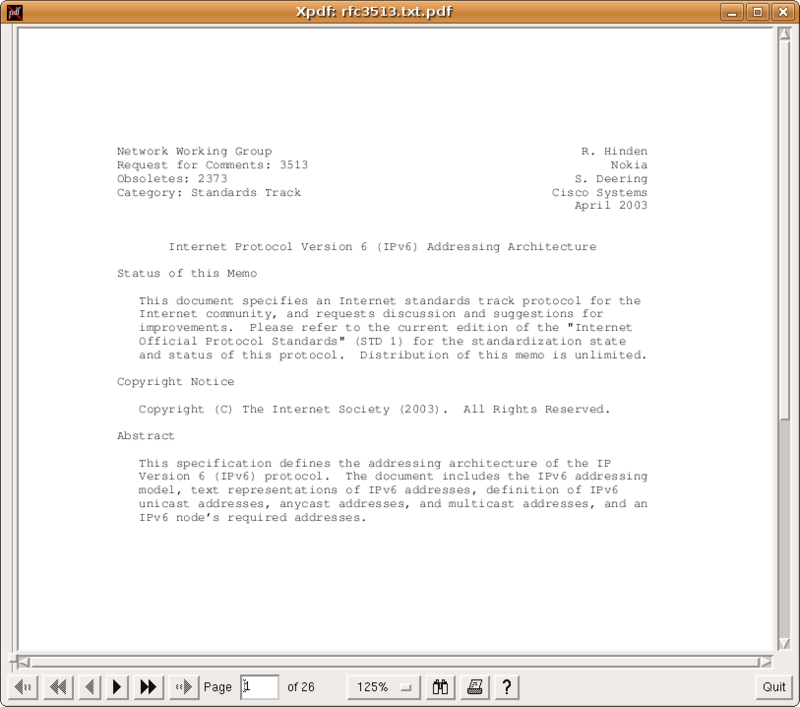 It looks radically different from the Courier displayed by xpdf, gv, and Adobe Acrobat. What I expected: a font which looks like "Courier." embolden it and it will be correct -- but I haven't been able to figure out how that is configured. > n022003l.pfb: "Nimbus Mono L" "Regular"
It displays correctly on my Evince, I don't know if it's because I installed msttcorefonts or ttf-liberation (probably the second). 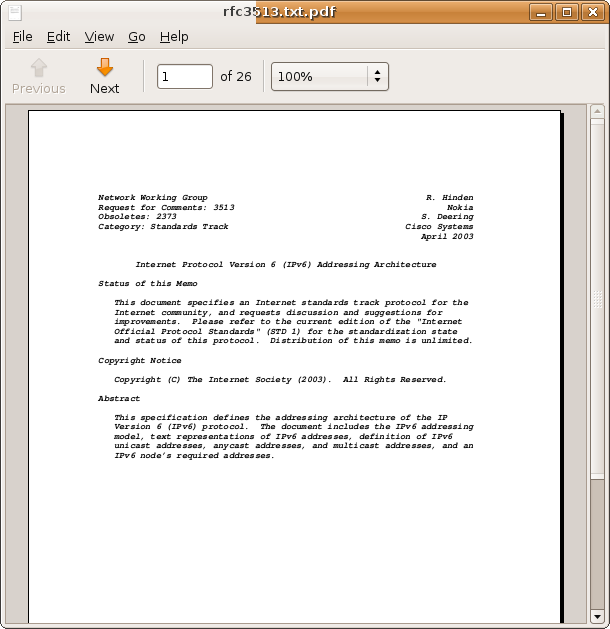 Can you try installing ttf-liberation and open the pdf again with evince? an emboldened and obliqued version of that font. I haven't been able to figure out why. My Evince also claims to be displaying "Courier, Type 1, Not Embedded", but we get different results. What I'm really asking is if there's a way to figure out which actual font is being used to represent "Courier." 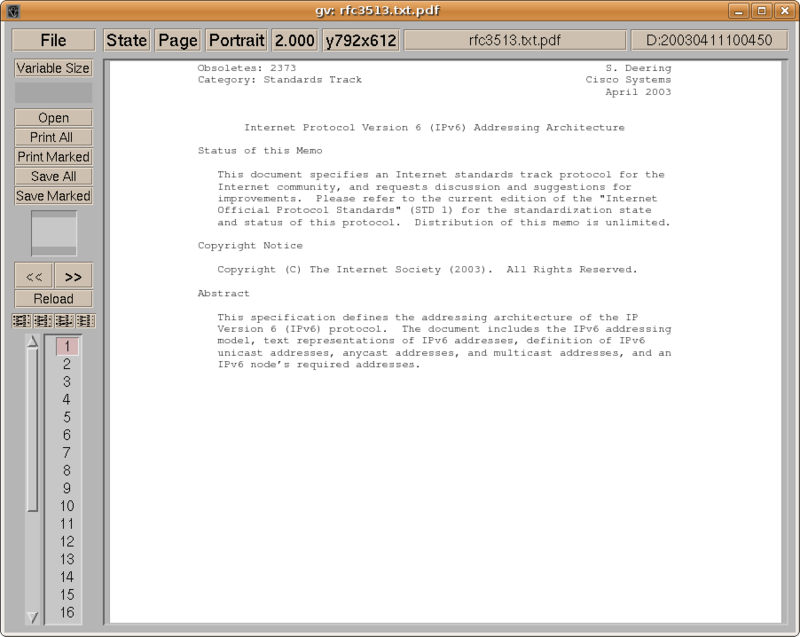 Specifically, which file is being read for its font information. I've looked into this enough to know that basically Evince is using Poppler which uses Fontconfig to find an appropriate font. Fontconfig doesn't come up with a vanilla Courier, it comes up with another typeface which looks like Courier. If you look at the files in /etc/fonts you can see the mappings. Also, there is an attachment to this bug called 'fc-match --verbose output for "Courier"' which shows what Fontconfig is choosing on my system. What's strange is that Fontconfig seems to do the right thing. "Nimbus Mono L", "Regular" should look good and also be correct. Possibly Evince is getting the right font from Poppler/Fontconfig and deciding to make it oblique and bold. I don't know and I don't know how to determine what Evince is doing. May I suggest raising the priority of this bug? I realize it may not be as exciting as file system corruption, but it is highly visible. *Possibly* there's something funny about my system, but as far as I know I'm running fully up to date stock Ubuntu 8.04LTS. That means this bug probably occurs often. It's also just the kind of thing that makes a Windows user think they should keep using Windows. That example is not hypothetical. fc-match courier gives me the same result as yours: n022003l.pfb: "Nimbus Mono L" "Regular"
"fc-match courier" on "Intrepid Ibex" also gives "Nimbus Mono L", "Regular" which is the correct font. To confirm this, do "fc-match --verbose courier" to show you exactly which file stores this font. Then install something like Fontforge which will you look at exactly what is in that file. If you set Evince to 400% you can compare what you see with the contents of the file. On working systems you should see that it's the same typeface. In other words, on every system we've looked at -- working or non-working -- fc-match is doing the same thing and it's probably the right thing. Which means the problem is probably in Evince or maybe Poppler. The problem was fixed in "Intrepid Ibex". If the fix can be identified, then it should be put into "Hardy Heron" as well since it is still a supported version. I burned a "Hardy Heron" CD and booted it. The problem is still present, which shows that there's nothing special about my installation. (For the record, I used this image: "ubuntu-8.04.2-desktop-i386.iso".) This problem must be widespread or universal among "Hardy Heron" users. I compared the "evince" executable from "Hardy Heron" with the working "evince" executable from "Intrepid Ibex." The Poppler library has changed from "libpoppler-glib.so.2" to "libpoppler.so.3". This suggests the problem exists the first library and not the second. 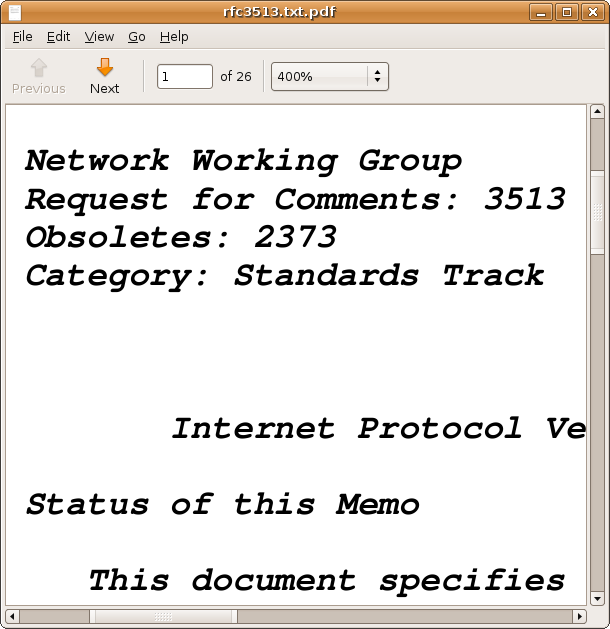 On that page, Stephan Klein on 2008-03-31 describes a bug which is clearly the same as this one. I'll add poppler as an affected product. It's not clear to me that bug #131523 is a duplicate. The symptoms are different. What Stephan Klein describes is the same bug as this one, but he describes it on a page which is addressing what (I think) is possibly a different bug. I'm currently looking through the bugs for Poppler at freedesktop.org. I'm pretty sure this problem was fixed between Poppler versions 0.6.4 and 0.8.7. The previous is used with "Hardy Heron" and the latter is used with "Intrepid Ibex." That means there may well be a bug report already. are at the above URL along with a code sample which demonstrates the problem. Fontconfig is the culprit. Evince calls Popper which calls FcFontSort in libfontconfig to find the font most similar to "Courier." The first font it gets is "Nimbus Mono L", "Bold Oblique". The right font is actually the next one, "Nimbus Mono L", "Regular". I see this on "Hardy Heron" as well as "Intrepid Ibex." The problem is not visible in Evince or Poppler on "Ibex", probably due to extensive changes in Poppler. It may affect anything that calls libfontconfig, however. On "Heron", I hard wired Evince to choose the second font and everything worked perfectly. > 0: "Nimbus Mono L", "Bold Oblique", "/usr/share/fonts/type1/gsfonts/n022024l.pfb"
> 1: "Nimbus Mono L", "Regular", "/usr/share/fonts/type1/gsfonts/n022003l.pfb"
> 2: "Nimbus Mono L", "Bold", "/usr/share/fonts/type1/gsfonts/n022004l.pfb"
> 3: "Nimbus Mono L", "Regular Oblique", "/usr/share/fonts/type1/gsfonts/n022023l.pfb"
> 4: "DejaVu Sans Mono", "Book", "/usr/share/fonts/truetype/ttf-dejavu/DejaVuSansMono.ttf"
libfontconfig does the wrong thing. thanks you Peter, linking the report and reassigning to fontconfig, thanks again. I can't access launchpad. Reopen the bug if you are willing to actually report *here*. I'm fairly sure that this bug has been fixed in poppler already. I'm pretty sure the bug is in fontconfig and not in poppler. 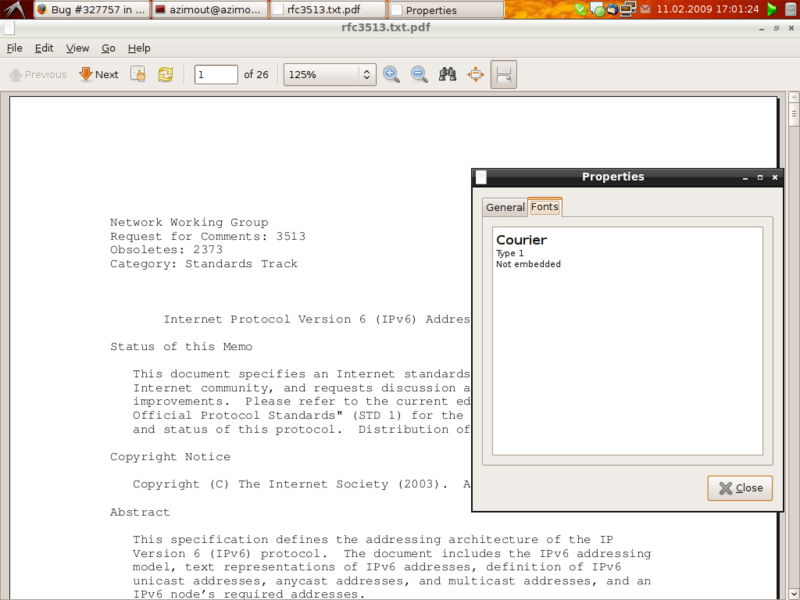 It looked to me like more recent versions of poppler did not exhibit the bug because they call fontconfig differently. However, the underlying bug remains in the fontconfig library and will affect other people who try to use the library. It demonstrates that FcFontSort is apparently not sorting correctly and, actually, gives a different result from what fc-match gives. The fix has not made it to users of Hardy Heron. My test code above suggests it hasn't reached Intrepid Ibex, either. I looked at the FreeDesktop bug reports and it looks to me as if a workaround was put into Poppler, but that the underlying bug was not fixed. That bug appears to be that certain typefaces like "Nimbus Mono L Bold Oblique" are not actually monospaced, even though they are supposed to be. "Nimbus Mono L Bold Oblique" is identical on Hardy Heron and Intrepid Ibex. Would the correct solution be simply to correct those fonts, and look around for any other monospace fonts with the same problem? Evince shows this file correctly in Karmic Koala 9.10 with all the latest updates. However typing "exec ./fchello" (without the quotes) at a command prompt produced no output, but instead closed the terminal window. What does "exec ls" do? I bet it also kills your terminal window. I'm just guessing, but since exec is replacing your shell with another program, I would think that the terminal program is detecting it, not liking it, and giving up. In any event, the problem doesn't seem to be related to "fchello". It will probably work if you just type "./fchello" on the command line. Hope that helps! 0: "Nimbus Mono L", "Bold Oblique", "/usr/share/fonts/type1/gsfonts/n022024l.pfb"
1: "Nimbus Mono L", "Regular", "/usr/share/fonts/type1/gsfonts/n022003l.pfb"
2: "Nimbus Mono L", "Bold", "/usr/share/fonts/type1/gsfonts/n022004l.pfb"
3: "Nimbus Mono L", "Regular Oblique", "/usr/share/fonts/type1/gsfonts/n022023l.pfb"
4: "DejaVu Sans Mono", "Book", "/usr/share/fonts/truetype/ttf-dejavu/DejaVuSansMono.ttf"